The time has finally come—our last full day in Ecuador. The day after our excursion to Isla de la Plata, we flew back to Quito so we could catch a plane the following day for home. Flying from Manta to Quito is a difference of over 9000 feet, which takes a bit of acclimatizing. However, rather than spend the day relaxing, we decided to go a bit higher and check out Volcan Pichincha, an active volcano that is part of a range called the “Avenue of Volcanoes,” which contains the highest volcanoes in the world. 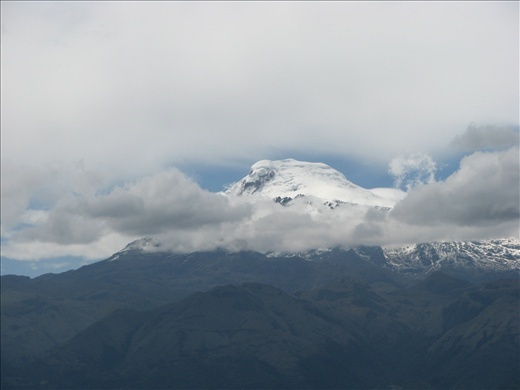 Volcan Pichincha borders the west side of Quito and stands at 15,695 feet in elevation. To get there, we hopped aboard the TeleferiQo, which is a gondola that takes you to a height of about 13,300 feet. At this height, the views of the volcanoes in the distance and the city below are truly breathtaking. Although we started off too late to make it to Pichincha’s summit by dark, we hiked along a ridge for several hours and made it to the base of its rocky peak at 14,750 feet—my highest hike to date (but not David’s highest by a long shot). It was a great last day to a wonderful trip. And this brings us to the present. As I write this entry, I’m aboard one of the flights from which I was mysteriously canceled (I was mysteriously canceled from two, even though the airline had already issued me boarding passes for both flights). This is after we discovered that the airline saw fit to add a layover to our itinerary without notifying us—and don’t even get me started on how they lost David’s bag on his way into Quito. Flying is its own special challenge (especially on Continental Airlines, I find), but is even more frustrating when you can compare it to a flight that you just took in another country—a developing country, I might add—and that flight went smoothly and seemed a million times less complicated. It seems the ongoing theme of this trip has been ‘challenges,’ but I am happy to say that each one turned out well in the end. Being alone in my volunteer placement was tough, but the work was still immensely rewarding. Trying to learn a new sport while overcoming a phobia was challenging, but my kiteboarding lessons were still fruitful, incredibly fun, and left me inspired to continue to work at it. And the repeated mishaps with the airline will still eventually bring us back home. I guess if there is one thing that I’ve learned from traveling the world, it’s that nothing turns out exactly the way you expected, so if you approach it with that expectation, then it’s easier to learn and grow from the challenges that present themselves. The alternative—allowing the challenges to overcome you, leaving you angry and bereft of the ability to find enjoyment—just doesn’t seem like an option.